What is everyone working on? To be honest, I’m not writing too many client freelance writing jobs lately. This blog and a few personal projects take up the bulk of my time, but I did stumble on some of my old clips from ten years ago which I’m going to rework with a more current slant and pitch to markets. Mostly though, I’m just doing my thing here. I’m pleasantly surprised by the wonderful comments and suggestions being put forth on our survey. 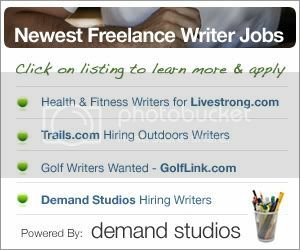 If you haven’t yet filled out the Freelance Writing Jobs Network community survey, may I respectfully request you do so. It shows us what we’re doing right – and wrong – and allows us to adapt with you. Knowing what you want and like helps us to fine tune this network to your needs. We are looking for a careful writer (i.e., blogger with pro research skills) to add content to our new Career Guide service. Your focus will be researching and blogging helpful information to visitors who are evaluating various certification/designation options (e.g., CFA, FRM, CFP). Interest in professional finance is desirable (deep experience/expertise not necessary, curiosity and diligence is more important). Please provide compensation requirements and writing sample(s). Life’s getting busy and I’m looking for a little help for the Freelance Writing Jobs blog. An experienced writer is needed to help pick up the slack right here on the homepage. Topics to help freelance writers land lucrative opportunities. Web Content Writing – Be on your guard for this one. They’re looking for serious quantity. It’s Sunday morning as I start this post. I have some time to spare this week and I’m using it to get ahead. To me, there’s no better feeling than knowing I had a productive day. Actually…there is something better – knowing that I’m ahead for the week and I can take it a bit easier and put in extra time on a few projects. To be honest, finding leads is the most tedious part of the day. It takes two to three hours to get it done every morning. That’s why I try and get as much done the night before, so my whole morning isn’t spend doing the job search. It’s not that I don’t enjoy it, but I do like to get it out of the way so I can work on other fun stuff. I need talented writers for putting together entertaining informational articles across a wide variety of subjects – from portable air conditioners to swimming pools, and everything in between. The ideal applicants will be able to conduct research and write about often potentially bland subjects in and interesting, engaging manner. Please also do not apply for this position unless you are able to produce at least five to ten quality articles per week (with a minimum of 500 words each). If you think this sounds like you, please send me an email at [email protected] with a short paragraph about yourself and your background, as well as any experience you have in the freelance writing field (if applicable). I hope you enjoy today’s lists. There’s lots of good stuff here today. Let us know if you particularly enjoyed something mentioned in today’s lists. What’s Your Freelance Writing Back Up Plan? What are You Reading and Where? From the Files of Deb Ng: Are We There Yet? Grant Writer – Denver – Full time but telecommute is Ok.
Write for Hippie Magazine – They promise $5 – $50 – Make sure you’re being paid on the higher end of the spectrum.